The Abbott government is pushing its plan to change environment laws after so-called “vigilante litigation” overturned the massive Carmichael coal mine. The plan was defeated because the Federal court found Environment Minister Greg Hunt had not properly considered advice about two threatened species, the yakka skink and the ornamental snake. The law requires that the Minister consider these conservation advices so that he understands the impacts of the decision that he is making on matters of National Environmental Significance, in this case the threatened species. The yakka skink is a robust lizard around the same size as a blue tongue lizard. 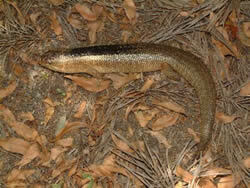 The average size from head to tail tip is 40cm, making it one of the largest skinks in the region. Its body colour ranges from pale to dark brown, usually with a broad dark brown stripe extending along the back from the neck to the tail. Yakka skinks occur in a wide variety of vegetation types including poplar box, ironbark, brigalow, white cypress pine, mulga, bendee and lancewood woodlands and open forests. Substrates include rock, sand, clay and loamy red earth. The Ornamental Snake is a brown, grey-brown or black snake growing up to 50 cm in length with lighter coloured body scales, often with darker streaks/flecks. 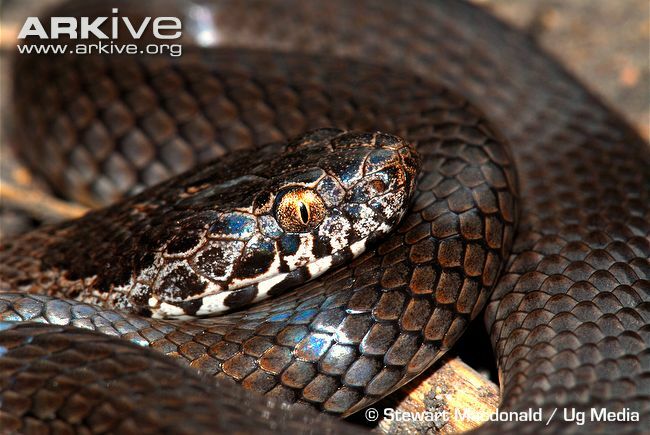 The crown of the head is darker brown/black with lighter flecks, it has distinctly barred lips, a white/cream belly with dark spots/flecks on the outer edges, and smooth scales (Cogger 2000). The Ornamental Snake’s preferred habitat is within, or close to, habitat that is favoured by its prey – frogs. The species is known to prefer woodlands and open forests associated with moist areas, particularly gilgai (melon-hole) mounds and depressions in Queensland Regional Ecosystem Land Zone 4, but also lake margins and wetlands. The country’s top legal officer, Attorney General George Brandis, wants to make it harder for people to challenge large scale developments like the Adani coal mine. Australia is already infamous for species extinctions and threatening processes. The area is the home of the endangered Black-throated finch, threatened Waxy Cabbage Palm, the Mellaluka Springs and koalas. These are important to the case because they are each expected to be impacted by the mine should it proceed. Greenhouse gas emissions from the mine, and Adani’s environmental track record, had not been taken into account. “Not taken into account” would be the new “norm” if our government had its way! The plan to change environment laws to stop green groups mounting legal challenges to big developments is an admission that our environmental policies and protective laws are not entrenched, or enshrined, as part of our constitution, but vulnerable to political sway and corporate pressure. The incremental process of dismantling our biodiversity protection policies, and environmental security, can’t be compensated for by economic benefits. Abbott’s rant of “jobs and growth” is shallow, self-destructive and counter-productive if our life-supporting environment, natural resources and heritage are all obliterated in the process.